Measles is an illness caused by a virus. It's very infectious, meaning it spreads very easily. When someone with measles coughs, sneezes and talks, they release droplets into the air. You can catch measles by breathing in the droplets. You can also catch it from touching an infected surface or object such as a door handle. People who haven't been vaccinated or have a poor immune system have a higher risk of getting measles. Symptoms of measles include fever, cough, inflamed red eye (conjunctivitis) and runny nose. The fever usually starts seven to 18 days after you're exposed to the virus. After two to five days a rash appears, which is red with small raised bumps. It usually starts behind your neck and ears before spreading to the rest of your body. Measles can sometimes cause serious problems such as swelling on the brain. Vaccination is the best way to prevent measles. The MMR vaccine is used to prevent measles, mumps and rubella. Children receive two doses of this vaccine as part of the National Immunisation Schedule. They receive one dose at 15 months and one at 4 years. Immunisation is 99% effective after the second dose. People born before 1969 have usually had measles and are considered immune. From 1969 to 1992, children were only given a single dose of measles vaccine. If you were born in this period, you're more at risk of catching measles and are eligible for a funded second measles vaccine through your general practice. If you think you or your child has measles, you should phone your GP to arrange testing and assessment rather than visiting your GP or after-hours clinic. Your GP may arrange for a throat swab and a blood sample to be tested. There's no medicine to treat measles. The treatment is aimed at relieving symptoms. Rest, drink plenty of fluids and use paracetamol or ibuprofen (ask your GP or pharmacist for advice) to help with fever and pain. You should phone your GP again if your child becomes very drowsy, confused or unresponsive. You're considered to be immune from measles if you have received two doses of the MMR vaccine, were born before 1969 or have had measles previously. If you have measles, you'll be infectious from five days before the symptoms start to five days after the rash appears. If you aren't immune and think you may have been exposed to measles, you should stay in isolation from the time you may have become infected until five days after the rash first appears. This means staying home from school or work and having no contact with unimmunised people, including not having visitors to your home. If others in your household are unimmunised, they also need to stay in isolation. This includes not visiting your GP or after-hours clinic. If you think you or your child has measles, you should phone your GP for advice. Information about measles in children, including photographs and links to further information, and information about immunisation. 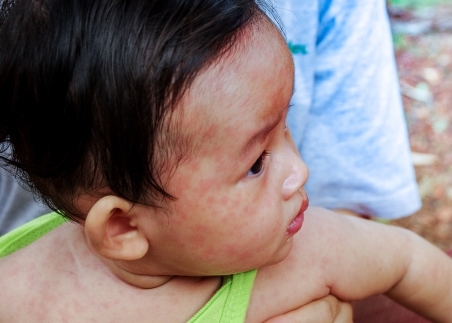 This page explains measles, including the symptoms, possible complications, and prevention. Immunisation Advisory Centre – Measles. Retrieved November 2017.